EN EL LLIURE DE GRÀCIA, EMILIO GUTIÉRREZ CABA Y ÀNGEL LLÀCER LE ECHAN TODA SU ENERGÍA Y SU TALENTO A RELATO DE UN NÁUFRAGO, LA MEGACRÓNICA DE GARCÍA MÁRQUEZ, ADAPTADA POR IGNACIO GARCÍA MAY Y DIRIGIDA POR MARC MONTSERRAT DRUKKER, CON IMAGINATIVA ESCENOGRAFÍA DE JON BERRONDO. MÁGICA ADAPTACIÓN DEL “RELATO DE UN NÁUFRAGO” QUE SE HA ESTRENADO EN EL LLIURE DE GRÀCIA. (…) TODOS LOS ELEMENTOS (…) SE FUNDEN ARMONIOSAMENTE Y SE PRESENTAN COMO UN MILAGROSO BLOQUE DE TALENTO, DESDE EL MAGNÍFICO PLANTEAMIENTO ESCÉNICO DE LA OBRA, SU IMAGINATIVA ESCENOGRAFÍA PASANDO POR LOS ASPECTOS SONOROS, DE ILUMINACIÓN, LA TRAGICÓMICA BRILLANTEZ DE LOS DIÁLOGOS, LA PORTENTOSA CONCEPCIÓN GENERAL DEL ESPECTÁCULO Y SU DIRECCIÓN. Y, DESDE LUEGO, LA EXTRAORDINARIA INTERPRETACIÓN DE LOS DOS INTÉRPRETES (…) AMBOS ACTORES, CÓMPLICES, SE COMPLEMENTAN, INTERCAMBIAN PAPELES DE NARRADOR A PROTAGONISTA Y SE MUEVEN EN EL ESCENARIO CON EL DINAMISMO PROPIO QUE PROPORCIONAN UNOS DIÁLOGOS RÁPIDOS Y BIEN ENLAZADOS Y UNA DIRECCIÓN AL MISMO NIVEL. UN ESPECTÁCULO ORIGINAL, ÁGIL Y FASCINANTE QUE NINGÚN AFICIONADO AL TEATRO DEBE DEJAR ESCAPAR. LUEGO SERÁ DEMASIADO TARDE. HOY UN LLENO ABSOLUTO Y PRESUMO QUE ESA SERÁ LA TÓNICA PARA LAS REPRESENTACIONES QUE RESTAN HASTA EL 4 DE DICIEMBRE. PERÒ EL PRINCIPAL ATRACTIU DEL MUNTATGE ÉS LA RECREACIÓ DEL NAUFRAGI (…) NO ÉS QUE DEMANI LA IMAGINACIÓ DELS ESPECTADORS SINÓ QUE ELS TRANSPORTA DE COP I PER SORPRESA A LA PÀTINA DE REALISME MÀGIC QUE VOL TRANSMETRE EL RELAT DE GARCÍA MÁRQUEZ. (…) UNA TREBALLADA I SUGGERENT IL·LUMINACIÓ D’ALBERT FAURA QUE COMPLETA EL JOC AMB L’ENGINYOSA PEÇA ESCENOGRÀFICA DE LA TAULA MULTIÚS DE JON BERRONDO. ***** NÀUFRAG I REPORTER SON, AQUÍ, ÀNGEL LLÀCER I EMILIO GUTIÉRREZ CABA. TOTS DOS ESTAN EXTRAORDINARIS EN ELS SEUS PAPERS AMB LA DOSI DE DRAMATISME I HUMOR EN LA MIDA JUSTA. (…) UNA MAGNÍFICA I ORIGINAL ESCENOGRAFIA DE JON BERRONDO ENS TRANSPORTA DES D’AQUESTA OFICINA A UN MÓN MÀGIC ON RECREA L’AVENTURA AMB UNA ACURADA POSADA EN ESCENA I ACOMPANYADA D’UN AUDIOVISUAL QUE COMPLEMENTA LES ESCENES EN EL MAR. 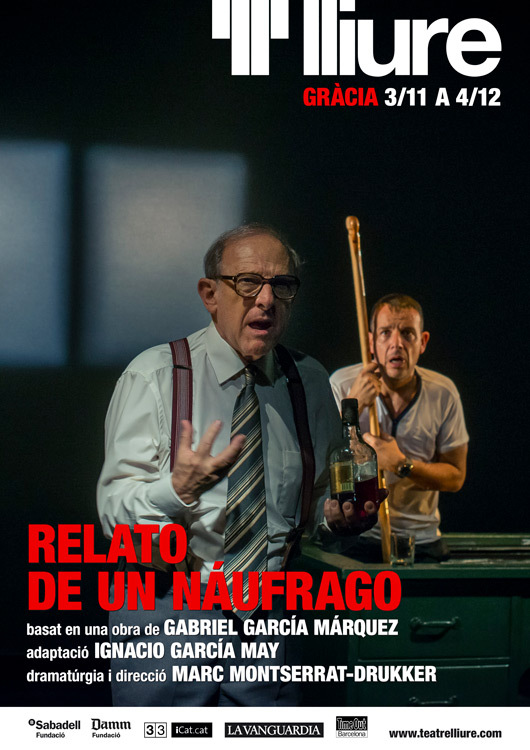 @PINTO_MTERESA UNA OBRA SENSACIONAL: #RELATODEUNNAUFRAGO #GABRIELGARCÍAMÁRQUEZ AL @TEATRELLIURE @MARCMONTSERRATD @AGENCIABALCELLS @ANGELLLACER ENHORABONA! @JESUSZAPATERO UNA MOLT BONA POSTA EN ESCENA DE #RELATONAUFRAGO AL @TEATRELLIURE .